"Craziest game in Mets history?!? I say yes!" He's a Yankees fan. We'll forgive him for not being totally familiar with Mets history. If you're a Mets fan, you're not just used to heartbreaking defeat. You're used to crazy. Win or lose. No matter how you slice it, a 20-inning game provides a lot of eye-popping data. * The Mets used 24 players, including everyone except Friday's starter Oliver Perez. Even Sunday starter John Maine was used as a pinch runner in the 13th. Saturday was the first time in Mets history that they beat a position player posing as a pitcher. This was the first time in Mets history that they won a game lasting 20+ innings. They're now 1-3 in 20+ inning games. My colleague in ESPN Stats and Information, Greg Dohmann found a way to make Mets fans feel bad even in victory. He notes: Each of the last eight teams to win a 20+ inning game failed to make the playoffs. The last to make the postseason was the 1980 Astros. We counter Greg's note with one that invokes two memorable Mets seasons. The Cardinals left 22 men on base. The last time a Mets opponent left 22+ on base was in a 9-8 14-inning loss to the Phillies on April 12, 1986. The last time the Mets won a game in which their opponent left 22+ on base: May 24, 1973 in Los Angeles, in a 19-inning win against the Dodgers. The Mets went to the World Series in both 1973 and 1986. We can invoke another Mets championship season, 1969, thanks to Sal D'Agostino at the Elias Sports Bureau, who tells us that the Cardinals were the first team to score a game-tying run in the 19th inning since July 27, 1969, when the Seattle Pilots (now known as the Milwaukee Brewers) scored a run to tie in the 19th against the Boston Red Sox. The Red Sox, much like the Mets, would hang on to win in 20 innings. This was the first time in Cardinals history that they lost a game of 20+ innings. They're now 3-1 in such affairs. The 19 pitchers used threw a combined 652 pitches to face 158 batters. Alex Cora who had played first base for only four innings in a career that spanned 1,122 games, made a game-saving catch of a popup. As you may have heard on the game broadcast: It was the first major league game in 20 years in which a team used two position players as pitchers. The last was on July 20, 1990, when the Expos used a pair -- Dave Martinez and future Met Junior Noboa -- while getting blown out by the Astros. We wonder if it was Cardinals third base coach Jose Oquendo's idea to throw Felipe Lopez and Joe Mather. On May 14, 1988, Oquendo, an infielder, pitched the 19th inning for the Cardinals against the Braves, and allowed a two-run double in a 7-5 loss. Mather's not the last position player to get a decision though. Amazingly, a position player has now gotten a decision in three straight seasons. Mather joins Josh Wilson (2009 Padres) and Jamie Burke (2008 Mariners) as those who have taken losses. Yadier Molina's game-tying hit was the only Cardinals hit with a runner in scoring position all day/night. They finished 1-for-18. That's tied for the worst-ever performance by a Mets opponent that got that many at-bats with runners in scoring position, along with the 1973 Dodgers (in a 19-inning game) and the 1967 Pirates. The 10 Cardinals strikeouts with runners in scoring position were one short of the most in the majors in the last 36 years (done multiple times). The last time Mets pitchers whiffed 10 hitters with runners in scoring position? May 11, 1990, when Dwight Gooden whiffed 15 in all in a 9-4 win over the Dodgers. Elias also shares with us that this is the second day in MLB history to feature a 20+ inning game and a no-hitter. The other: April 27, 2003. 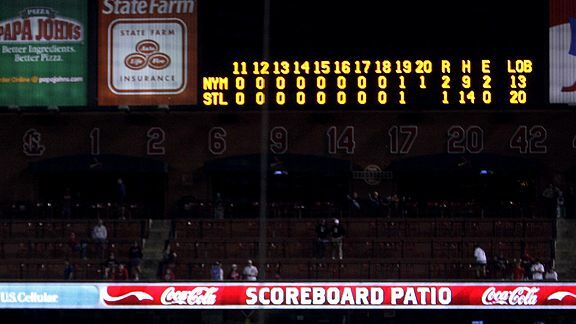 Kevin Millwood of the Phillies pitched a no-hitter, and the Cardinals(!) beat the Marlins 7-6 in 20 innings (after the Marlins tied the game with a five-run ninth). Early in the night, we thought this would be our best note: It had been nearly 32 years since a Cardinals pitcher threw seven-or-more innings of one-hit ball against the Mets. The last: John Urrea in 1978, but how about this? Urrea was one of three Cardinals to pitch seven innings of one-hit ball against the Mets that season, along with John Denny and Silvio Martinez. Garcia pitched this well in his third big league start. Martinez went one better, taking a no-hitter through six innings in his first start. So after all that, is this the craziest game the Mets have ever played? In 1964, the Mets lost a 23-inning game to the Giants, one that included Hall of Famer Orlando Cepeda hitting into a triple play. In 1965, they played an 18-inning scoreless tie against the Phillies. The season ended the next day. In 1968, they lost 1-0 in 24 innings to the Astros on a booted double play ball, though that was in The Year of the Pitcher when scoring any runs was a challenge. In 1974, against these same Cardinals, they lost in 25 innings when Bake McBride scored from first base on an errant pickoff throw. The standard setter for the craziest game in Mets history was a game in Atlanta on July 4, 1985. That one included a cycle (by Keith Hernandez) , multiple rain delays, and an infamous game-tying home run by Rick Camp with two outs and two strikes in the 18th inning. The Mets would score five in the 19th to win it, the game ending with Ron Darling striking Camp out, and the Braves delivering on their as-promised Fireworks Night celebration ... at 3:55 a.m.
Then-Braves announcer John Sterling called it "The wildest, wackiest, most improbable game in history," following Camp's home run. He's a Yankees fan, too, from what we know. Wonder how he'd compare that one to Saturday's game?